World renowned fly fishing expert Brian O'Keefe will give a presentation on fly fishing for trout at the February meeting of the South Sound Flyfishers. His topic will cover lake trout food including the most common bugs and insects that trout eat plus the fly patterns to imitate them. Also covered will be the techniques, tackle and timing to use those fly patterns. You will feel more effective as an angler after seeing this show. Also discussed will be information about six Northwest stoneflies. The information provided will apply to your favorite streams in Washington, Idaho, Oregon, Montana and Alaska. 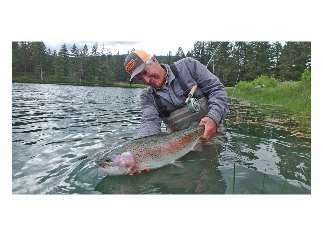 Don't miss this presentation by this world class fly fishing expert. 5046 Boston Harbor Rd. N.E.